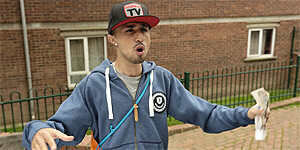 Co-written and co-directed by Adam Deacon, Anuvahood cheekily sets itself up as an unofficial comedy threequel to Kidulthood and Adulthood (though without the blessing of writer/director Noel Clarke), which also co-starred Deacon. Set in a London council estate, the film features Deacon as Kenneth, who quits his job at a supermarket in order to pursue his dreams of becoming an MC, but comes under pressure from his parents (Linda Robson and Perry Benson) to get a job or move out, because they have serious money problems. After befriending visiting foreign student Enrique (Ollie Barbieri from Skins), Kenneth (or K, to give him the street name that no-one but him uses) decides to sell cannabis on the estate with his dopey friends Bookie (Femi Oyeniran), T.J. (Jazzie Zonzolo) and Lesoi (Michael Vu). However, Kenneth's plan quickly falls down when he comes up against lisping neighbourhood psycho Tyrone (Richie Campbell). To be fair, Deacon and co-director Toland maintain an impressively manic level of energy in the direction, with all the dialogue delivered at breakneck pace. Unfortunately, this quickly gets irritating and it starts to feel as if everyone involved took massive amounts of amphetamines before each scene. Perhaps the most amusing aspect of the film is the shameless reliance on product placement – it would be interesting to know just how much of the budget came from Fruitella (“It's a BADMAN sweet, ya get me?”), Chupa-Chups and Reggae Reggae sauce (Levi Roots even has a cameo). The main problem is that while Deacon can be an effective supporting player, he's not likeable or sympathetic enough to carry off a lead role; basically, you know something's gone wrong when the hero's getting beaten up and you're cheering for the villain. Similarly, despite the energy in the dialogue, several of the scenes are over-indulgent and run way too long (e.g. Tyrone bullying the boys) and there's also a jarring shift into violence in the final act that's both over the top and unnecessary. On top of that, many of the jokes fall painfully flat or are badly misjudged, such as a scene where a cameoing Aisleyne from Big Brother gets viciously punched in the face. It remains to be seen whether the target audience will respond to Anuvahood, but this is a disappointing comedy that suffers from a painful lack of laughs and a severe shortage of likeable characters.